When you need office furniture for your new or existing office space, come to BiNA's batcave - our Call to Order Online is the haven for all Gothamites needing desks, credenzas, bookcases, cubicles and more! Browse our online sampler for just a taste of the breadth of products we carry — visit our showroom for complete selection and details on all items we sell. And find your own inner super-hero! Today! Welcome to the city that never sleeps. The center of world commerce, take a moment and get yourself a durable quality executive desk and filing cabinets to manage all of your important documents and client paperwork. Now more than ever it's important to be on top of your game to win the game! 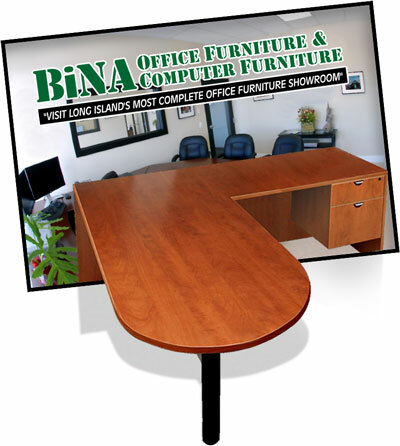 Bina Office Furniture experts are here 6 days a week to fulfill on our promise to get you the desks, bookcases, reception room furniture and conference tables you need to conduct business the proper way. No job is too big or too small — we've got it all here, in one 30,000 square foot showroom. Bring in your floorplan to map out your next cubicle project too. No sleeping on the job — hurry in or call us at 516-248-5858 to get your professional office off the ground! Now!